Richard Warch, who served as president of Lawrence University for 25 years, passed away peacefully after a battle with cancer Saturday morning, Sept. 14, 2013 at his home in Ellison Bay, Wis. He was 74 years old. Warch came to Lawrence in 1977 as vice president for academic affairs and professor of history. In 1979 he succeeded Thomas Smith, who had been president since 1969. 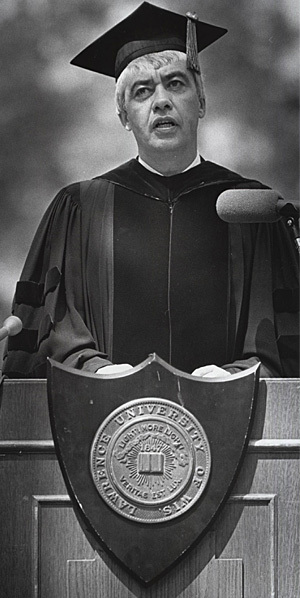 He became the college’s 14th president on July 1, 1979, and retired from that office on June 30, 2004. 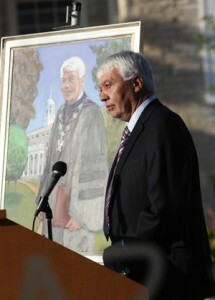 Warch was the second-longest serving president in Lawrence’s history. Only Samuel Plantz, who served 30 years as Lawrence’s president from 1894 to 1924, had a longer tenure. Nearly one-third of Lawrence’s 20,000 alumni now living graduated during Warch’s presidency. Many people of all ages knew Warch affectionately as “Rik,” and his own story and Lawrence’s are so intertwined in “the Warch years” that it is impossible to separate them. Warch loved Lawrence and he practiced his presidency with zest, style, intellect, wit and warmth. He was a tireless and effective champion of the liberal arts college and of the unparalleled benefits and joys of a liberal education, especially as Lawrence practiced it. He extolled the residential liberal arts college model as a powerful and life-changing kind of education. He used many of his 25 annual Matriculation Convocation addresses at Lawrence, and numerous other occasions, to articulate the virtues of liberal learning. He compiled these addresses in a book, titled "A Matter of Style: Reflections on Liberal Education," that the Lawrence University Press published in 2011, and which Lawrence made available to the public in 2012. "So many people had the pleasure of knowing Rik as a colleague, friend and teacher," said Lawrence President Mark Burstein. "During his 25 years as president he strengthened the university’s academic offerings, constructed much of what we call our campus today and fostered an engaging learning environment through personal charm and intellectual discourse. Rik also revitalized Bjorklunden and more closely connected our northern campus to the university’s mission. "All of us at Lawrence will have many opportunities to celebrate his life in the coming weeks and months," he added, "but at this moment our hearts and prayers go out to his wife, Margot, and the Warch family." Former Lawrence president Jill Beck, who succeeded Warch in 2004, hailed him as "the most eloquent spokesperson I have ever heard" on the value of liberal arts education. "Rik was a partisan advocate for the kind of education Lawrence offers, and his persuasive oratory was a model for involved, educated citizens," said Beck. "I will remember his open-hearted manner, his warm laugh, his wit, his scholarly understanding. He was a beloved figure who put the community first while paying attention and care to each of its members. He will be greatly missed and our sympathy goes out to Margot and his family." Warch earned the faculty’s approbation for the variety of progressive steps he took. Early in his presidency he instigated a curriculum review, which resulted in a new set of general education requirements to replace the less precise divisional requirements then in place. He also reinstated Lawrence’s signature Freshman Studies program, which was started by his predecessor, Nathan Pusey, in 1945. The program was dropped for a brief period in the mid-1970s and reinstated as a one-term course in 1978. Warch persuaded the faculty to restore the program to its two-term format in 1986 by arguing that Freshman Studies provides continuity within each freshman class, with everyone reading, discussing, and writing about the same works their first year. Since 1945, the common book that Lawrence alumni share is Plato’s Republic, as it is the work that every veteran of Freshman Studies has read and parsed. Warch also transformed the Conservatory of Music, expanding its curricular scope and establishing its place firmly in Lawrence’s broad liberal arts curriculum. In earlier years, the college and the conservatory functioned as separate entities with different students, academic requirements and expectations. Under Warch’s leadership, students in both the college and the conservatory were invited and encouraged to sample each other’s worlds. Today, Lawrence continues to offer a bachelor of music degree, but it also offers a bachelor of arts in music, allowing students to double major in subjects as disparate as physics and voice performance. He paid direct homage to Wriston’s philosophy with the construction of a new art center in 1989, which met the longtime goal of integrating studio art and art history. Aptly named the Wriston Art Center, it was to be the first of six new and eight remodeled buildings, either built or transformed during the Warch years. He also oversaw the construction of the Buchanan Kiewit Center (1986); Shattuck Hall of Music (1991); Briggs Hall (1997); Science Hall (2000) and Hiett Hall (2003); as well major renovations to Alexander Gym (1986); Main Hall (2000); Youngchild Hall (2001) and the Seeley G. Mudd Library (2001), among others. Given the great need, capital campaigns thus became familiar and frequent fixtures during his presidency. And they were successful, always exceeding their goals. Warch covered the country soliciting funds from potential donors, usually lugging the very cumbersome equipment required in those days for showing even a brief film about Lawrence’s virtues. In addition to financing the buildings, the funds from these campaigns helped finance faculty chairs and scholarships for needy and/or worthy students. Under his leadership, Lawrence’s endowment grew from $23 million at the start of his presidency, to more than $182 million at the time of his retirement. 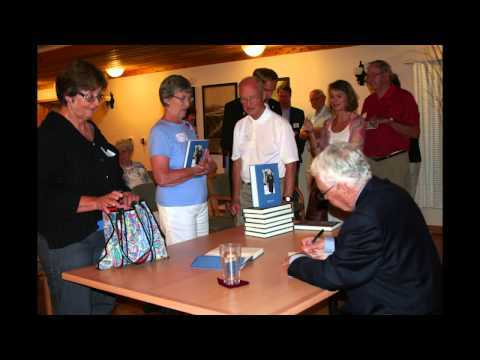 His crowning glory was the rebuilding and expansion of Lawrence’s presence at its beautiful northern campus, Björklunden, on Lake Michigan, south of Baileys Harbor in Door County. The transformation of Björklunden was the result of Rik’s early ability to identify the location’s potential as an integral part of the Lawrence educational experience. 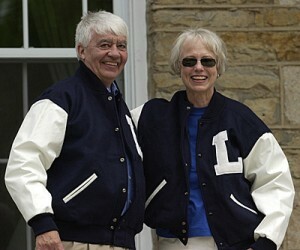 In 1963, the 425-acre property was given to Lawrence by Donald and Winifred Boynton. The lodge that had been the Boynton’s summer home burned irreparably in August, 1993 and the future of the property became uncertain at best. Most Lawrentians had never been there and many trustees knew it simply as a deficit item in Lawrence’s financial statements. 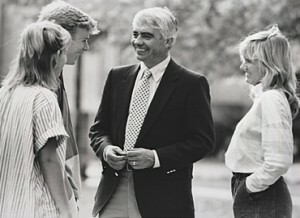 Its only connection to the college was the series of summer seminars – some taught by Lawrence faculty members – that small groups of alumni and friends attended beginning in 1980. He called for “broad participation of students and faculty in determining the content and contours of what [he] called a Björklunden experience and in devising the program to deliver it.” He posited “the universality of a Björklunden experience would be a common bond shared by all Lawrentians, a memorable, even a pivotal moment in their undergraduate years.” He felt this experience at Björklunden would be unique to the Lawrence brand of liberal education; no other liberal arts college would be offering anything quite like it. Warch worked tirelessly on steering Björklunden’s growth and promise, and on securing the resources to make that possible. For many years he chaired the Björklunden Advisory Committee, and at the annual gathering of the Boynton Society at Björklunden he was often the speaker, extolling the value Björklunden had added to a Lawrence undergraduate liberal arts education and to the lives of countless graduates and friends in the broader community. The trustees unanimously embraced his vision. Near the site of the burned lodge, the college built a new lodge equipped to house large groups of students and faculty during the school year, and almost immediately following its construction, had to start planning for an addition. Warch’s vision quickly caught on, and the summer seminars for adult education that had started in 1985 on a small scale, limited by the lack of housing and classroom space, expanded to meet the new and increasing interest and demand. “The revival and extension of Björklunden is … one thing I really care about,” Warch told Lawrence Today on the eve of his retirement. His vision of resurrecting the “Björklunden experience” and “opening it up to students and faculty for experiences and engagements beyond the classrooms, studios and laboratories of the Appleton campus” is now a reality. English professor Timothy Spurgin, who has taught many summer seminars and led students to Björklunden during the academic year as well, admonished his pupils last summer that, “every time you experience this wonderful place and savor its offerings, you should bow down and thank Rik Warch!” Since its relaunch, Björklunden has expanded steadily. It provided 112 seminars for nearly 1,600 students during the 2012-13 academic year. Warch unfailingly included the importance of personal interaction outside of the classroom in his view of liberal education. He enjoyed casual campus conversations with faculty and students, and looked forward to their concerts and athletic events. His regular attendance at conservatory concerts and recitals demonstrated his eclectic taste in music; he was as enthralled by a Lawrence Symphony concert as with the jazz improvisations. His favorite group of all time was the Sambistas. Warch was also an avid fan of Lawrence athletics and attended as many games, meets and races as he could, cheering on the Lawrence teams with gusto. He took pleasure in recognizing student athletes when he ran into them on campus and would take these opportunities to comment on a play that interested him or a skill he admired. Perhaps his greatest pleasure was reading bedtime stories to students in their residence halls, which he happily undertook as an integral part of his unofficial job description – “other duties as assigned,” as he put it. Several years after he retired, Lawrence secured the funds to build a version of the dream Warch had decades earlier, a campus center where the college’s constituents could gather and engage in various activities, a crossroads of the campus. The major donor, who remains anonymous, asked that the building be named the Richard and Margot Warch Campus Center, in honor not only of Rik, but of his wife Margot, who also played a vital role in the life of the Lawrence community. He was born August 4, 1939, in Hackensack, N.J., the son of George and Helen Warch. He earned a bachelor’s degree in history from Williams College in 1961 and then enrolled at Yale University, where he earned a bachelor of divinity degree in 1964 and a Ph.D. in American studies in 1968. In 1962 he and Margot were married. They traveled to Scotland where he spent his second year of divinity school at The University of Edinburgh. He was ordained a minister in the Presbyterian Church in 1964. Rik’s distinguished career in higher education began at Yale, where he taught history and American studies for nine years. While at Yale, he also directed its National Humanities Institute for two years and spent a year as associate dean of Yale College and director of the Visiting Faculty Program. In addition to A Matter of Style, he published School of the Prophets: Yale College, 1701-1740 and co-edited the book John Brown, from the Great Lives Observed Series. He also published numerous articles in scholarly publications on American religious history, U.S. history, and liberal education. 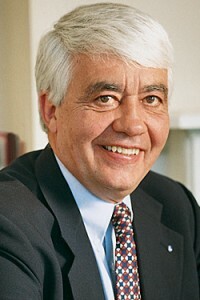 He served as chair or director on numerous boards during his career, among them Competitive Wisconsin Inc., Wausau Insurance Company, the National Association of Independent Colleges and Universities, the Associated Colleges of the Midwest, the Wisconsin Ethics Board, the Appleton Development Council, the Fox Cities Chamber of Commerce, and the Fox Cities Performing Arts Center. 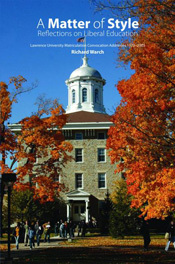 By virtue of his office, Warch also was a trustee of Lawrence University. In 1987, Warch was cited as one of the country’s top 100 college presidents in the two-year study, “The Effective College President,” which was funded by the Exxon Education Foundation. Following Rik’s retirement, Lawrence recognized him with an honorary Doctor of Humane Letters degree at the college’s 2005 commencement. Ripon College presented him with an honorary Doctor of Humanities degree in 1980. During his retirement in Door County, Warch appreciated opportunities to travel with Margot and enjoyed extended visits with his children, grandchildren and friends. He was a member of the Peninsula Players Board of Directors, active at the UU Fellowship and was a student as well as a teacher in seminars at Bjorklunden, where he was head of the advisory committee. He is survived by his wife Margot; his two sons and their families, who live in St. Paul, Minn.: Stephen, his wife Alexandra Klass, and their daughters Helen and Zoe; and David, his wife Sarah, and their daughters Sydney and Georgie; and his daughter Karin, a Ph.D. candidate who studies and teaches in London, England. He is also survived by his sister Linda Fenton, his aunt Betty Hansen, his brothers-in-law Peter Fenton and Bob Moses, his sisters-in-law Lois Moses, Marilyn Moses, Marysue Moses, and their families. A memorial service will be held at Lawrence on a day and time still to be determined. Memorials in Rik's name can be directed to Lawrence University for the Warch Family Scholarship Fund or for the benefit of Bjorklunden. A public memorial service honoring Rik's life and legacy will be held Saturday, Nov. 16 at 11 a.m. in the Lawrence Memorial Chapel. A reception in the Warch Campus Center will follow the service. The memorial service also will be webcast live at livestream.com/lawrenceuniversity. Do you have a memory of Rik that you'd like to share? We're putting together a remembrance and would love to include yours.